Third Quarter “Crew of the Quarter” is Eric Heino and Brett Harnish. Eric and Brett have demonstrated that they are committed to working safely! Congratulations to both of you! Second quarter “Crew of the Quarter” is Mark Johnson and Chris Langer. Mark and Chris have completed all required training and maintained a safe and steady production! The winners have received lunch along with a half day paid off. Keep up the good work! 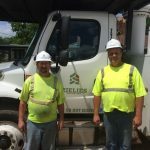 The United Way of the Greater Chippewa Valley, awarded Zielies Tree Service the ” Day of Caring Award” for their seven-year participation in Day of Caring!